A couple years ago, while looking for a rainy-day activity to do with the kiddo, I came across a recipe for “unicorn poop cookies.” Which sounds disgusting, but is actually just colored sugar cookie dough shaped like, well, poop. Needless to say, they were a huge hit with my son. So when his birthday rolled around this week and we were thinking about treats to pass out to his classmates at school, guess what he requested? Now, these are not easy cookies to make. You don’t just mix up the dough, plop ’em onto a cookie sheet and bake for 10 minutes. You’ve got to first make the sugar cookie dough, then divide it and color each batch. You let it all firm up in the fridge for awhile, THEN you have to roll each color out into thin ropes, combine them, twist, cut and coil to make them look like rainbow poops. It’s a tedious and time-consuming process. I have to say, my dough LOOKED beautiful! The colors came out super vibrant, almost like Play-Dough — bright red, blue, green, yellow and purple, and I was excited to see them come together in the finished product. However. When I tried to roll them out, I realized I must have used too much flour because they refused to cooperate and crumbled in my hands. After 30 minutes of trying to roll out one decent rope with no success, I nearly broke into tears. With two hours until lunchtime (and because I’m apparently crazy), I decided to whip up a new batch on the fly using a different recipe and going a little lighter on the flour measurement. There was no time for the dough to chill, but fortunately, it rolled out like magic! Boom! The cookies did flatten out while baking more than I had anticipated, and they didn’t taste as good as the previous batches I’d made, but at least they were passable. If nothing else, I was all set to tell the kids they were rainbow, tie-dyed sugar cookies. Hope renewed, I worked right up to the buzzer, with the last batch of cookies coming out of the oven about 10 minutes before I had to pack them to transport the few blocks to school. I had just long enough to send a friend a message lamenting the whole fiasco, who pointed out that her daughters’ school doesn’t allow parents to bring in homemade treats for birthdays. Only wrapped, packaged or store-bought items. Something that hadn’t even crossed my mind. I thought about just winging it, taking in my treats and either playing dumb or begging for an exception. But, figuring better safe than sorry, I called over to my son’s school to ask what the policy is. And sure enough. The fruits of my labors were strictly forbidden. You. Have. Got. To. Be. Kidding. Me. Soundly defeated, I rushed to Taylor’s Bakery for two dozen yellow and pink bunny-shaped sugar cookies and got to school only 5 minutes late for lunch. The bunny cookies went over well with my son’s classmates. My son, on the other hand, took one look in the box and told me he really didn’t want any anyway. EPILOGUE: I took the cookies to my son’s birthday party the following day; they were a HUGE hit with the 10-and-under crowd. The holidays demand sweets. That’s just all there is to it. When I was growing up, one of the events I most looked forward to was our church’s annual holiday tasting party. Each year on the first Sunday evening of advent, the church played host to a huge seasonal program. Following the big show, the tasting party would take over the basement to offer table upon table laden with every imaginative use of sugar one could fathom. All created by the loving hands of the church ladies and you know as well as I do, no one cooks like a church lady. Here how’s it worked: you’d grab a paper plate and troll the aisles, loading up with anything that struck your fancy. Cookies, brownies, buckeyes, cupcakes, Rice Krispies treats, bars, chocolate-covered whatever, sweet Chex mix, corn flake wreaths, peanut butter fudge, butterscotch chow mein noodle haystacks… good grief. It’s enough to send me into sugar shock just thinking about it. Looking back, I’m not sure how it was successfully managed, but it was. I don’t think actual fights broke out over the last item on any given plate, but the potential was definitely there. I do seem to remember an awful lot of hyper children running around that basement. Every year around the first of December, I start sorting through my cookie recipes, intending to recreate some old favorites and maybe try a few new ones. I even picked up a jar of red and green holiday sanding sugar at Michael’s the other day in anticipation of this year’s baking extravaganza. I’d like to try my hand at sugar cookies and gingerbread men, but I’ve traditionally not had good luck with these kinds of dough. In fact, the last time I attempted to make gingerbread men, I recall spending an entire afternoon painstakingly mixing, rolling, cutting, decorating and baking them, only to bite into one and discover that it tasted like nothing but straight-up flour. Bleh. 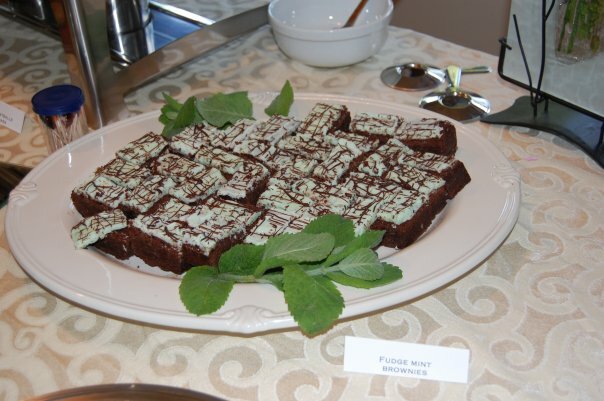 To me, nothing says Christmas like the winning combination of chocolate and mint. (It even brings back fond memories of mixing up mugs of peppermint schnapps-spiked hot chocolate in my IU dorm freshman year.) I’ve got a wickedly decadent recipe for crème de menthe brownies, and another for double chocolate chip cookies with crushed candy canes that I plan on dusting off within the next week or so. I’m all for collecting other ideas and suggestions. If you’ve got a favorite cookie recipe, holiday or otherwise, feel free to post as a comment below. In the meantime, here’s a recipe I made several times last year to much acclaim. It’s super easy, doesn’t require many ingredients to fuss with, and is consistently delicious. Enjoy – and bring on the sweet eats! In a heavy saucepan over low heat, melt the white chocolate squares, sweetened condensed milk and salt. Remove from heat and stir in crushed cookies. Spread evenly into a wax paper-lined 8-inch square pan. Chill 2 hours or until firm. Turn fudge out onto a cutting board; peel off the wax paper and cut into squares. Keep refrigerated until ready to serve.